The airline’s latest A321-200 order makes it apparent that, along with the Boeing 737-900ER, Delta will use the type to replace the Boeing 757s and MD-88s it now uses on its domestic network. 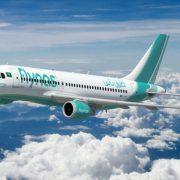 Air Côte D’Ivoire, the national airline of Ivory Coast, has signed a firm order for two Airbus A320neos and two A320s. IAG’s follow-on order comprises two Airbus A330-300s, two A330-200s and 15 A320neos. Airbus and IAG announced the order on November 9, at the Dubai Airshow 2015. Every jet Airbus builds on its new A320-family final assembly line at Mobile in Alabama will be delivered to a U.S. customer, according to Fabrice Brégier, Airbus president and CEO. The IndiGo order, which is the largest in Airbus’ history in terms of the number of aircraft involved, was signed on August 15, on the 69th anniversary of India’s becoming an independent nation. The A350s and A330s are slated for Iberia’s fleet modernization and to open new long-haul routes, and the A320neos will be allocated to the group’s airlines for fleet replacement, according to Airbus.